A smaller tablet from Amazon with an 8-inch screen and running on the Fire OS 5.4.0.0 operating system at time of test. The Amazon Appstore is included for downloading additional apps. Tested with 16GB of storage. 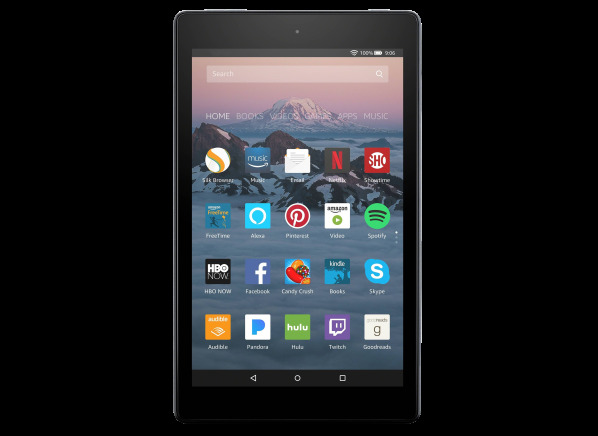 The Amazon Fire HD 8 2017 (16GB) is a smaller tablet with an 8-inch screen. It has a display resolution of 1280 x 800, and produces typical detail at 190 pixels per inch. The rectangular screen is a better shape for videos than for photos. The tablet has a 1.3GHz ARM MT8127 processor and ran on the Fire OS 5.4.0.0 operating system at time of testing. It has 1.5GB memory and is available with 16GB storage. You can add a micro-SD memory card for more storage. You can connect to the internet using 802.11n WiFi. It has Bluetooth and you can mount a flash drive. It has a 0.3-megapixel webcam and a 1.5-megapixel camera. The Amazon Fire HD 8 2017 (16GB) measures 8.4 inches long by 4.8 inches wide by 0.1 inches thick. Without a keyboard, it weighs 0.8 lbs. Act as WiFi hotspot Act as WiFi hotspot Can use a mobile data plan to connect other devices to the Internet. Some carriers charge extra for this. Fingerprint-resistant screen Fingerprint-resistant screen Screen coating reduces adhesion of skin oils and makes cleaning easier. Detachable keyboard included Detachable keyboard included Price includes a detachable keyboard that folds like a laptop. Detachable keyboard optional Detachable keyboard optional A detachable keyboard that folds like a laptop is available at additional cost. Swype-capable keyboard Swype-capable keyboard Offers an alternative way to type by sliding a finger to each letter in a word. Approved app market Approved app market Can access a rich variety of apps authorized by the operating system manufacturer. Detachable carrying case Detachable carrying case Includes a detachable carrying case. Active stylus optional Active stylus optional An optional stylus ("pen") is available that can interact with the screen to draw lines of varying width. Active stylus included Active stylus included Includes a stylus ("pen") that can interact with the screen to draw lines of varying width. Operating system Operating system The underlying program that runs the user interface and applications. Color Color Indicates the available colors of the case of the tablet. A slash separates multiple colors on the same unit, while a comma separates available color choices.